Are you a real estate agent? Are you considering managing rental property for a little extra income? A lot of real estate agents choose to manage a rental property where they can earn anywhere from 7-15% of the rent. At Specialized Property Management Dallas, we know that it might seem like a great idea to manage a rental property in addition to helping people buy and sell houses. But the truth is, it can become a hassle to manage a rental property if you’ve never done it before. For example, what if you’re on your way to show a home to a client and one of your tenants calls you. A pipe under the kitchen sink has burst, and you need to get a maintenance team out there right away. Taking care of your tenant in this situation could cost you a home sale! If you decide you want to work with us, we will pay you a referral fee just for referring a new owner to us! That means if you find someone who is interested in renting out their home, all they have to do is sign an agreement with Specialized Property Management Dallas to manage their home for them. In return, you’ll get $350 for each new owner that signs. You can collect as many referral fees as you want! There are no limits to how much you can earn! We don’t want you to lose out on any sales, so as soon as a property goes back on the market, we refer it back to you to sell. We’ll link your information to the property, so there’s no chance of anyone else stepping in to grab it. It’s a good way to stay on excellent terms with the owner so when you regain the listing everything goes smoothly. At Specialized, we want experienced real estate agents like you to take the listings when owners decide it’s time to sell. Sometimes property market sales are slow, so we want you to have full access to as many listings as possible during those times so that you can generate a steady income. No other Dallas property management company out there takes care of real estate agents as we do. In the real estate business, it’s all about who you know. When you partner with us, you’ll increase your client base, while also building a positive character and reputation. 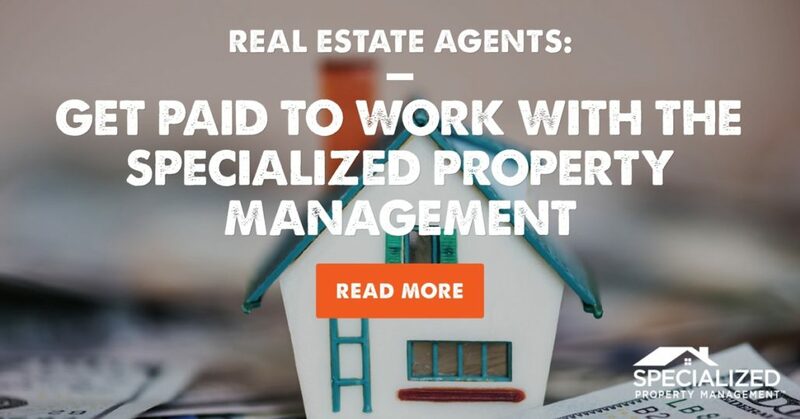 You can trust Specialized Property Management Dallas to deliver the same excellent service you offer your clients to further build your credibility and reputation. At Specialized, we follow through on our promises. We’ll help you gain your clients’ trust by sharing rental rate estimates, rent readiness assessments, and suggested improvements for their rental property. That way when you meet with investors they’ll have a complete solution from industry experts. We only ask that you suggest us as the property manager when the purchase is completed. On-going Communication and Online Account Access. Each rental property owner will have access to their own online owner portal so they can keep tabs on their rental home from wherever they are! The portal makes it easy for owners to access any updates on the property like vacancies, leasing, maintenance, inspections, and financial reports. Comprehensive Marketing and Advertising. We lease most homes in under 28 days, and that’s because we know how to advertise the property. We list it on 80 popular websites, our own website and several other outlets in the Dallas/Ft. Worth Metroplex. Thorough Tenant Screening and Selection. Our tenant screening process includes an extensive background check where we check credit, criminal, and rental history. We also verify that the tenant is can make the rental payment every month with a combined tenant income of at least three times the rent rate. We do everything we can to ensure you’re getting a reliable tenant. Prep Your Property. We help owners get their property “rent ready” and make sure it has the curb appeal it needs to attract potential tenants. Timely Rent Collection. We use ACH to ensure money is deposited every month into the owner’s bank account, and we don’t mess around if a tenant doesn’t pay. We have a strict collections process that begins the moment rent is late. Cost-Effective, Reliable Maintenance. We are proactive about maintenance and conduct regular property inspections to catch issues before they become expensive problems. In short, no other Dallas property management company does more for rental property owners. Specialized Property Management Dallas has over 30 years of professional property management knowledge and expertise. When we combine our knowledge with your extensive real estate sales experience, you have a winning formula! We are the Dallas residential property management company dedicated to a positive working relationship with real estate agents. Call us today to start earning more cash with our Real Estate Agent Referral Program.